Valiant has finally resurrected its Shadowman series, with a new look and a new take on the character. The story begins with Alyssa Myles, a self-appointed voodoo priestess who's doing her best to safeguard New Orleans from the evil supernatural forces that threaten it. She finds herself facing a powerful opponent - and then an unexpected figure joins the fight. 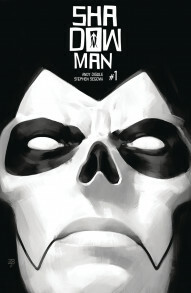 A lot of the issue is given over to bringing the reader up to speed on who and what Shadowman is - and where he's been. With powerful art and a strong story, this series is off to a good start - proving that in comics, death is just a temporary inconvenience.